Die casting Die casting is a metal casting process that is characterized by forcing molten metal under high pressure into a mold cavity. The mold cavity is created using two hardened tool steel dies which have been machined into shape and work similarly to an injection mold during the process. Most die castings are made from non-ferrous metals, specifically zinc, copper, aluminium, magnesium, lead, pewter and tin based alloys Depending on the type of metal being cast, a hot- or cold chamber machine is used. The casting equipment and the metal dies represent large capital costs and this tends to limit the process to high volume production. Manufacture of parts using die casting is relatively simple, involving only four main steps, which keeps the incremental cost per item low. It is especially suited for a large quantity of small to medium sized castings, which is why die casting produces more castings than any other casting process. Die castings are characterized by a very good surface finish (by casting standards) and dimensional consistency.The main die casting alloys are: zinc, aluminium, magnesium, copper, lead, & tin; although uncommon, ferrous. Zinc:- The easiest metal to cast; high ductility; high impact strength; easily plated; economical for small parts; promotes long die life. Aluminium:- Lightweight; high dimensional stability for complex shapes and thin walls; good corrosion resistance; good mechanical properties; high thermal and electrical conductivity; retains strength at high temperatures. Magnesium:- The easiest metal to machine; excellent strength-to-weight ratio; lightest alloy commonly die cast. Copper:- High hardness; high corrosion resistance; highest mechanical properties of alloys die cast; excellent wear resistance; excellent dimensional stability; strength approaching that of steel parts. Lead and Tin:- High density; extremely close dimensional accuracy; used for special forms of corrosion resistance. Such alloys are not used in foodservice applications for public health reasons. Type metal, an alloy of Lead, Tin and Antimony (with sometimes traces of Copper) is used for casting hand set type in letterpress printing and hot foil blocking. There are two basic types of die casting machines: Hot-Chamber Machines & Cold-Chamber Machines.These are rated by how much clamping force they can apply. Typical ratings are between 400 and 4,000 st (2,500 and 25,000 kg). Hot-chamber machines, also known as gooseneck machines, rely upon a pool of molten metal to feed the die. 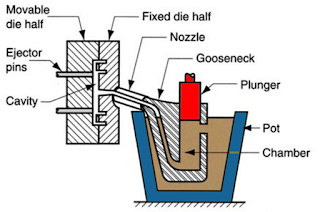 At the beginning of the cycle the piston of the machine is retracted, which allows the molten metal to fill the "gooseneck". 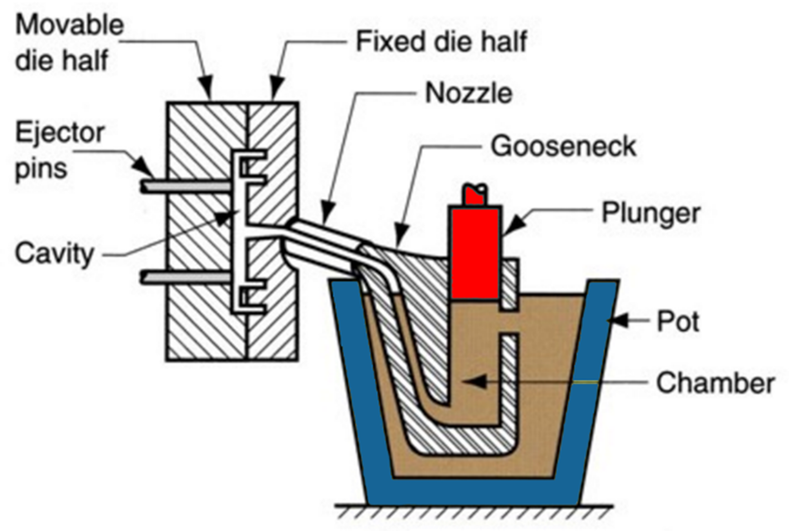 The pneumatic or hydraulic powered piston then forces this metal out of the gooseneck into the die. The advantages of this system include fast cycle times (approximately 15 cycles a minute) and the convenience of melting the metal in the casting machine. The disadvantages of this system are that highmelting point metals cannot be utilized and aluminium cannot be used because it picks up some of the iron while in the molten pool. Due to this, hot-chamber machines are primarily used with zinc, tin, and lead based alloys . These are used when the casting alloy cannot be used in hot chamber machines these include aluminium, zinc alloys with a large composition of aluminium, magnesium and copper. The process for these machines start with melting the metal in a separate furnace. Then a precise amount of molten metal is transported to the cold-chamber machine where it is fed into an unheated shot chamber (or injection cylinder). This shot is then driven into the die by a hydraulic or mechanical piston. This biggest disadvantage of this system is the slower cycle time due to the need to transfer the molten metal from the furnace to the cold-chamber machine. Two dies are used in die casting one is called the "cover Die Half" and the other the "Ejector Die Half". Where they meet is called the parting line. The cover die contains the sprue (for hot-chamber machines) or shot hole (for cold-chamber machines), which allows the molten metal to flow into the die this feature matches up with the injector nozzle on the hot-chamber machines or the shot chamber in the cold-chamber machines. The ejector die contains the ejector pins and usually the runner, which is the path from the sprue or shot hole to the mold cavity. 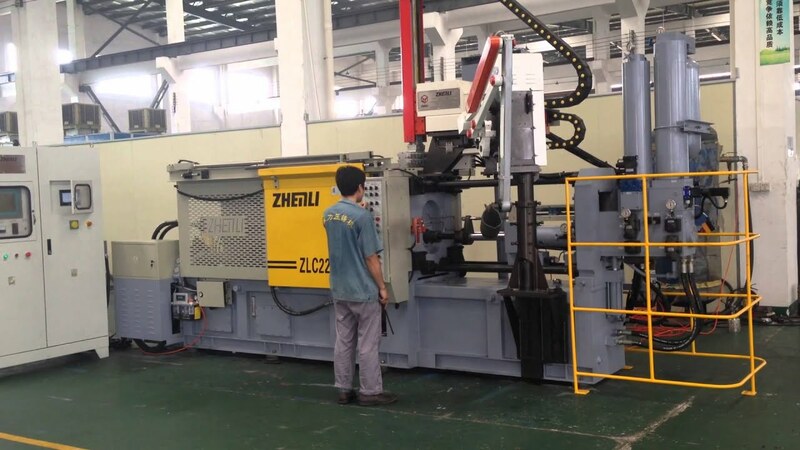 The cover die is secured to the stationary, or front , platen of the casting machine, while the ejector die is attached to the movable platen. The mold cavity is cut into two cavity inserts, which are separate pieces that can be replaced relatively easily and bolt into the die halves. Excellent dimensional accuracy (dependent on casting material, but typically 0.1 mm for the first 2.5 cm (0.005 inch for the first inch) and 0.02 mm for each additional centimeter (0.002 inch for each additional inch). Smooth cast surfaces (Ra 1–2.5 micrometres or 0.04–0.10 thou ). Reduces or eliminates secondary machining operations. Rapid production rates. Casting of low fluidity metals. The main disadvantage to die casting is the very high capital cost. Both the casting equipment required and the dies and related components are very costly, as compared to most other casting processes. Therefore to make die casting an economic process a large production volume is needed. Other disadvantages are that the process is limited to high-fluidity metals, and casting weights must be between 30 grams (1 oz) and 10 kg (20 lb). In the standard die casting process the final casting will have a small amount of porosity. This prevents any heat treating or welding, because the heat causes the gas in the pores to expand, which causes micro-cracks inside the part and exfoliation of the surface .